Both the Giulia and Stelvio are getting a raft of new customizations. Alfa Romeo will be at the Geneva Motor Show this year to highlight the brands return to Formula 1 with two ‘Alfa Romeo Racing Edition’ variants of their Giulia Quadrifoglio and Stelvio Quadrifoglio models. These models will come equipped with Sparco racing seats with red stitching and a carbon shell structure, a Mopar automatic transmission knob with carbon inserts and a leather and Alcantara steering wheel also with carbon inserts. The Racing Edition models aren’t just about cosmetic changes either as both the Giulia and Stelvio QV will come with carbon-ceramic brake discs and an exclusive Akrapovic titanium exhaust to amplify the sound of the 2.9-liter twin-turbo V6 engine, which is also specifically tuned by Alfa Romeo engineers to increase power output. How much of an increase has yet to be revealed. In addition, the historic ‘Turismo Internazionale’ name will be introduced to the Stelvio range with the Stelvio Ti, a trim that Alfa Romeo only ever ascribes to its most lavishly equipped and high-tech versions. The model on display at Geneva will be equipped with a 280 horsepower 2.0-liter four-cylinder engine, eight-speed automatic transmission and Q4 all-wheel drive with a carbon driveshaft. Finished in Misano Blue with extensive use of carbon and matte black exterior trim the Stelvio Ti and similarly specced Giulia Veloce Ti will be on hand for visitors to admire. There will also be two new trims debuting in Geneva for their sporty hatchback, the Giulietta Super will offer a range of exclusive trim options while the sporty Giulietta Veloce will come with large Brembo brakes, sports bumpers and details changes such as larger diameter tailpipes and yellow brake calipers. 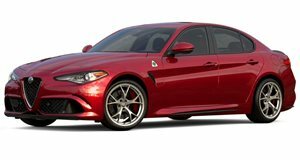 The 2019 model year Giulia will also be on display and Alfa Romeo promises that more exciting developments will be revealed at the official press conference at the Geneva Motor Show on March 5.